Mark McClish specializes in classical Hinduism, with a focus on early legal and political literature (dharmaśāstra and arthaśāstra). He holds a B.A. in Religious Studies from Indiana University and an M.A. and Ph.D. from The University of Texas at Austin in Asian Cultures and Languages with a specialization in Sanskrit and Indian Religions. His research uses a close reading of text to explore the intersection of the religious, legal, and political in classical Sanskrit literature. He is particularly interested in the relationship between royal and religious authority in classical South Asia, the development of Hindu law, and the political dimensions of Brahmanical orthodoxy in the period. 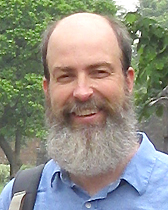 McClish’s current research uses a diachronic analysis of the Arthaśāstra of Kauṭilya, a first century Sanskrit treatise on statecraft, as a means of understanding how the text bears witness to the appropriation and transformation of legal and political discourses as cornerstones of a newly resurgent Brahmanical orthodoxy in the period. Other research interests include textual criticism, explorations of the religious and the political in South Asian history, and the relationship between Hinduism and law. He is the co-author of The Arthaśāstra: Selections from the Classic Indian Work on Statecraft (Hackett, 2012) and is currently completing a manuscript examining the textual history of the Arthaśāstra. In addition to other projects, he is co-translating the Mitākṣara of Vijñāneśvara, a 12th century Sanskrit legal commentary. His research has been supported by the European Research Council (SAW-ERC) and Fulbright, among other organizations. His areas of teaching include Hinduism, religion in classical India, Hindu law, and politics and religion. ‘The Four Feet of Legal Procedure and the Origins of Jurisprudence in Ancient India.’ (w/ Patrick Olivelle) Journal of the American Oriental Society 135.1 (2015): 33-47. ‘The Dependence of Manu’s Seventh Chapter on Kauṭilya’s Arthaśāstra’ Journal of the American Oriental Society 134.2 (2014): 241-262. The Arthaśāstra: Selections from the Classic Indian Work on Statecraft. Tr. with introduction and notes by Mark McClish and Patrick Olivelle. Cambridge: Hackett Publishing, 2012. ‘Is the Arthaśāstra a Mauryan Document’ in Reimagining Aśoka. Patrick Olivelle, Janice Leoshko, and Himanshu Ray, eds. Oxford: Oxford University Press, 2012: 280-309.